Over the course of human history, a combination of economics, resource scarcity and human ingenuity has dramatically changed how we construct our shelters. Nowhere is this change more evident than in the average American home. Gone are the days when the majority of people lived in modest homes they designed and built themselves out of rough timber, stone or packed earth. Today, these hardscrabble buildings have been largely replaced with spacious boxes clad in vinyl siding and asphalt shingling — and the boxes are getting bigger. The size of the average American home in 1950 was 983 square feet. In 2013, that number had climbed to just under 2,700, and some of today's so-called "suburban McMansions" can top 10,000 square feet. 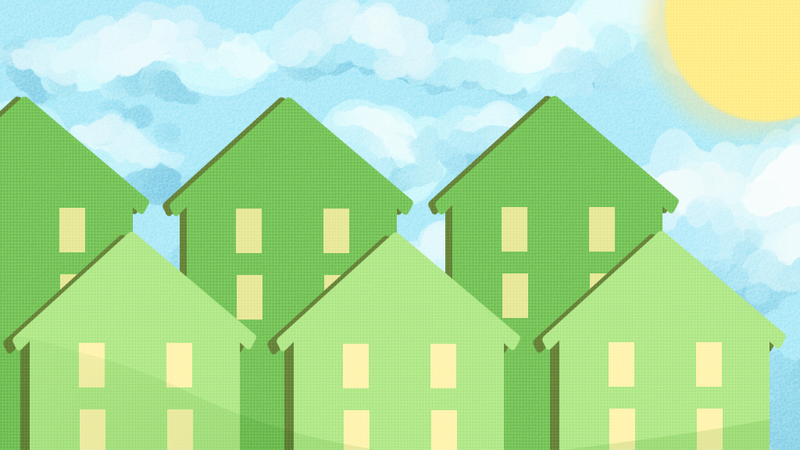 Our homes are getting bigger, but we're not putting more people in them. All that extra space is filled with — well, space. In 2004, 40 percent of new homes had nine-foot ceilings. Building bigger means using more resources per person to provide shelter, and it also means more energy is used to heat and cool our structures. According to the U.S. Energy Information Administration, residential and commercial buildings were responsible for 40 percent of all U.S. energy consumption in 2016. It is encouraging to note that this number is down from over 50 percent in previous years as energy efficiency continues to improve. However, 40 percent of 97.4 quadrillion BTUs remains a rather significant figure. RIT's sustainability commission has questioned the energy efficiency of its own buildings in internal inquiries. Many of the buildings on campus do not appear to have been designed with an ecologically favorable trade-off between architectural style and energy efficiency in mind. Gracie's features towering ceilings full of empty air space which must be heated and cooled while providing no extra usable square footage. Our hockey arenas, reportedly the two largest energy drains on campus, must keep a sheet of ice frozen 24/7 while maintaining a 60 degree atmosphere for the comfort of spectators. Even the new Golisano Institute of Sustainability has been criticized for its apparently inefficient and airy use of space. By contrast, the residence halls are high-rise buildings containing small, multi-person rooms and narrow hallways. They're built more like gloves than giant boxes. Though this may result in less wasted space from an energy perspective, it also comes with a reduction in privacy and comfort. Adding to the complexity, designers of modern buildings must the consider the materials and energy which go into manufacturing components and the construction processes. The way in which buildings are conceived, their components created and their structures realized is very different today than in past eras — a distinction which comes with a number of downsides and benefits. Before the advent of industrialization and globalization, construction was largely a local undertaking, with the exception of projects undertaken by the ultra rich. There were no factories in resource-rich areas churning out standardized parts to be sent to foreign climes. There were no container ships or railroads to ferry iron, petroleum or wood and stone across continents and oceans, nor was there a global communication network to bind such complex networks of trade. For the most part, every culture used what was most available to them in the place they currently found themselves. Homes today are erected very quickly by teams of specialized contractors using standardized parts and largely synthetic materials like vinyl, asphalt and fiberglass. This setup frees owners from the burden of building their own home, and since synthetics degrade so slowly, they have to spend less time on repairs. However, this convenience usually comes at a long-term cost. The dumpster has become a ubiquitous companion to all stages of building projects. While standardized sizes of lumber, drywall, insulation, siding and shingling simplify the design and construction process, the trade-off for speed and convenience is staggering amounts of wasted goods. Discarding offcuts from these materials is in itself a growing problem. Though synthetic materials require little maintenance over the life of a building they are notoriously difficult to effectively dispose of. Once combined with other construction materials, the difficulty inherent to separating them for proper disposal or re-use usually precludes any attempt to do so. Buildings generally exit the ecological loop in a jumbled heap at the county dump, where they will remain for the foreseeable future. The good news is that we as a global society are increasingly becoming aware of these problems. Many minds are at work changing the way we approach home construction today. Progress is being made on our own campus, albeit in a surprisingly unlikely way. Sarah Brownell is an alum of the Mechanical Engineering program and now a lecturer at the Kate Gleason College of Engineering (KGCOE) and the School of Individualized Study (SOIS) who teaches classes like "Engineering in the Developing World," among others. Her latest project has been a foray into housing — for flies. Brownell is working with a multidisciplinary team to develop a process to use black soldier flies to break down human waste. Brownell's non-profit, Sustainable Organic Integrated Livelihoods, had previously done work in Haiti on turning human waste into fertilizer in areas with limited or no basic sanitation. However the demand for the fertilizer produced was not picking up as quickly as hoped. “So I've been trying to think of other things to turn poop into. I heard this story on the radio about ... black soldier flies, that will eat any kind of food waste, but they also eat human waste, chicken waste, pig waste, so you can use them to process a lot of different wastes that you might want to compost. So I got really exited about it because if I can use them to turn poop into chickens, that would be a lot more lucrative. The chickens will eat the fly larva,” Brownell explained. The flies like the warmer, more humid climes of the Southern U.S., so in order to test her idea, Brownell and her team needed to build a special habitat that could withstand the dry, freezing cold Rochester winters without breaking the bank. Brownell's mentor, Bill LaBine, owner of Airtight Services in Marion, N.Y., suggested that the project make use of an emerging technology in the housing market: Passive Housing. A passive house is basically a super-insulated structure which regulates the interior temperature of the home much more efficiently than traditional stick frame houses. Owners of a passive house built recently in Avon, N.Y., spent only $236 to heat and cool the whole house for the entirety of 2017. This style of building uses double exterior walls filled with blown-in insulation and clad with a vapor barrier. All the exterior seams are sealed with impermeable tape. The moisture and heat barriers are reportedly so efficient that regular exchange of atmosphere is critical, because without ventilation carbon dioxide accumulating from human exhalations or exhaust from fireplaces and cooking devices would suffocate the occupants. “In a [passive] house, you would set [the ventilation system] to a certain number of air changes per hour, but normally houses just leak like crazy and you just have to keep adding heat,” Brownell explained. To make her project a reality, Brownell partnered with Dawn Carter, a professor in the Biology program and also the director of the community garden nestled between the Polisseni Center and the RIT woodlands. Her team has nearly finished construction on a cozy passive shed to house the soldier flies in the garden. They hope to bring visitors in during Imagine RIT to share the work being done on the composting project, the passive housing demonstration and other green projects currently running in the garden space. Though passive housing is a promising area of development, it is not without its challenges. “One of the problems with this style of building is that it's more done in Europe, so it's hard to get the parts here. There's more incentive to do environmental stuff in Europe. The governments are more supportive,” Brownell said. This is likely to change in the future, as more and more Americans become educated about the effects of their homes on the environment and on their wallets. The more people adopt greener building techniques, the cheaper they will become. Passive housing is just one example that has come out of the sustainable housing movement which began in the 1970s. After recognizing the worrisome direction the construction industry was taking, many called for a total abandonment of modern practices and a return to historical techniques of shelter completely free of dependency from electricity and fossil fuels. Others have faith in the human ability to continually design more efficient and sustainable technology capable of maintaining or improving our current standard of living. So far, there doesn't appear to be a one size fits all answer. Though the paths to sustainability are many and divergent, any step which causes one to tread more lightly on the earth is a step in the right direction.